I have a set of berlina black stage two ppg water base paint spoon aero mirrors. Bought 5 years ago. Paid 912.00 plus 400.00 for paint and prep. You'll be surprised how crappy these mirrors come from Japan/spoon. Pit holes everywhere, uneven surfaces must be prep professional for that quality look. For the price you pay close to a thousand dollars they should be ready for paint and or color matched to your S. Unfortunately I hear from all the big shops these may be discontinued in the future backorder for years now. I'll do $1,500 firm picked up SoCal coming off a magazine car that has rarely been in the sun. My car is stoted in a air temperature control garage. You're asking for more than the cost of mirrors, paint and prep?... these mirrors can be found for less than $800 if you look around. $400 paint and prep and I'll still save money. I'm scratching my head on this one. I’m sure you guys realized these mirrors are hard to find thus supply and demand comes into play. Seems like some of these guys here must be new s2000 owners, typical. Lol ah the condescending attitude that brings s2ki as a forum down. Bravo. Keep it up. Can someone please help me contact s2ki admins. I would like for them to see this guy trying to make fraudulent spoon aero mirrors. I want this dude banned immediately! I'm sure trying to make counterfeit parts from a race heritage company is against s2ki rules. Jesus I didn't realize this thread went off the rails so badly. 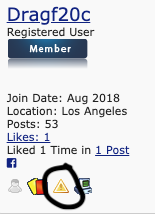 To anyone you can report a post by clicking the little report button under the user name (circled in the pic below. Not picking on you Drag was just the easiest example I could give quickly. This is the fastest way to have a mod look at a thread (and clean it up quickly before it goes totally of the rails). We try and keep an eye on things but we cannot look at every thread all the time. Now while offering replica parts is allowed trying to sell any items or services as a guest is NOT allowed. If you want to offer parts for sale you need to pay for a membership and post those parts in the classifieds. If you wish to offer commercial sales such as manufacturing a part and offering it for sale this requires being a vendor. Consider this a warning S2000LT as nearly every post of yours in the thread violated the rules. If anyone has additional questions PM me.